Appino & Biggs Reporting Service, Inc. produces a total electronic .pdf transcript package. This includes our electronic transcript with the exhibits hyperlinked. Our exhibits are OCR’d, are bookmarked and are fully text searchable. 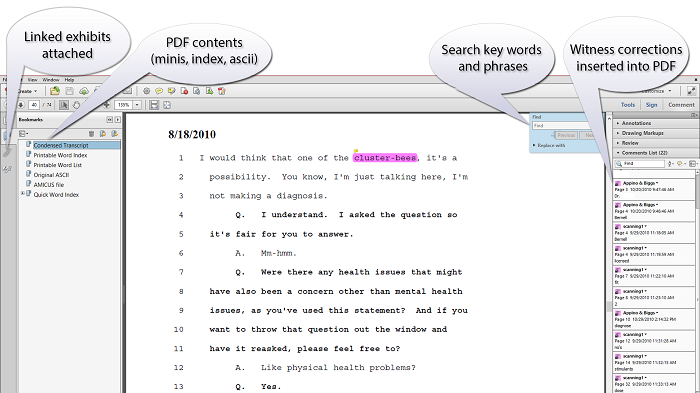 After the witness has had the opportunity to read and sign the deposition, any corrections or changes made by the witness are then inserted into our electronic .pdf transcript, giving you a total electronic transcript that can be filed with the court.